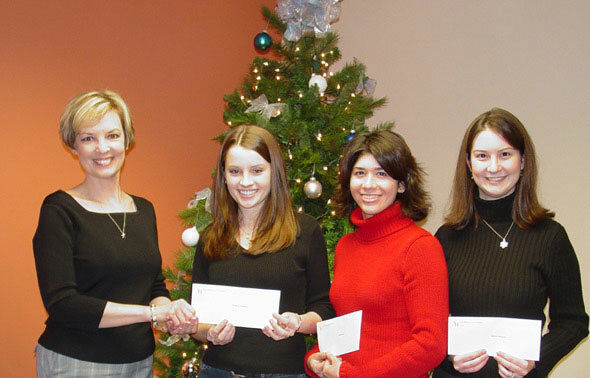 Assistant Dean of Students Mary Ellen Sims (far left) presents Parents' Association Scholarships to (left to right) Brittany Patterson, Lauren Smith and Melanie Machost. Three Sam Houston State University students have been named recipients of $1,000 scholarships provided by the SHSU Parents' Association for the 2004 fall semester. They are Melanie Machost of Livingston, Brittany Patterson of Pearland and Lauren Smith of Madison, Ala. The winners were selected by a committee comprised of university faculty and student services staff. The deadline for applications for Spring 2005 scholarships is February 4. For information about the application process contact Assistant Dean of Students Mary Ellen Sims at mesims@shsu.edu or 936-294-3026. Students whose parents are active members of the Parents’ Association may apply for the six annual scholarships. Requirements for selection include completion of at least 12 hours at SHSU, a cumulative GPA of 3.0, and enrollment in 12 semester hours in the semester the scholarship is awarded. Students may receive the scholarship only once while attending SHSU. Machost is a junior academic studies major with a specialization in early childhood education. She is the daughter of Gil and Sally Machost of Livingston. Machost is a member of Golden Key Honor Society, the SHSU Concert and Symphonic Choir, the Baptist Student Ministry Leadership Team and is employed as a tutor at the SHSU Writing Center. After graduation she plans to teach reading and possibly English as a second language overseas while pursuing a master's degree in English. Patterson is the daughter of Cheryl Patterson of Pearland. She is a sophomore radio and television major and journalism minor. She is news anchor and producer for 90.5 The Kat campus radio station and has held several positions with Cable Channel 7 news productions. She has volunteered with Region 6 Education Service Center and is employed off campus. She plans to pursue a career as a television news reporter. Smith is the daughter of Gurden and Teresa Smith of Madison, Ala. She is a junior Biology major and Chemistry minor and is a distance runner for the SHSU cross country track team. She participates in the Honors Program and is a member of Circle K International, a small group leader for the Baptist Student Ministry and a member of Tri-Beta Honor Society. She is a volunteer for the Texas Marine Mammal Network and is employed as a veterinary technician during breaks from school. Smith plans to attend veterinary medical school after graduation and plans a career as a marine mammal veterinarian. Parents of all SHSU students are encouraged to participate in the SHSU Parents’ Association, which supports students through a variety of programs throughout the year. They network with new and prospective parents during Saturdays@Sam and New Student Orientation, co-sponsor Parent and Family Weekend with the Dean of Students’ Office each fall, and provide apples, candy and scantrons to students before finals each semester.